Group Protesting Violence Draws Fire in Gaza Strip Hamas militants appear to be gaining the upper hand in the fight against gunmen from the rival Fatah movement in the Gaza Strip. There is now no talk of a cease-fire, and the "unity" government has collapsed. A group of Palestinians staged a protest against the fighting and came under fire. Palestinian civilians leave the area during clashes between Hamas and Fatah militants in Gaza City. Hamas' military wing has asked fighters and security men loyal to Fatah to give up their weapons as it pushes an offensive against its rival. Hamas militants appear to be gaining the upper hand in the fight against gunmen from the rival Fatah movement in the Gaza Strip. There is now no talk of a cease-fire, and the "unity" government has collapsed. A group of Palestinians staging a protest against the fighting Wednesday came under fire almost immediately. Palestinian Authority President Mahmoud Abbas says the bloodshed between rival factions Fatah and Hamas is "madness." But the fighting goes on, with at least 69 Palestinians killed since the latest round of fighting began over the weekend. 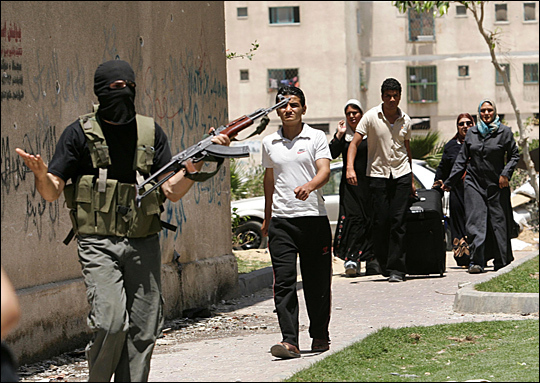 On the ground, the Islamist militants of Hamas continued to make gains. And in Gaza City, a civilian street demonstration against the violence was attacked. Several hundred distraught and angry civilians marched through the center of Gaza City on Wednesday, shouting "Stop the killing." Several women held a large banner that read, "To our decision makers: History will judge you and generations will not forgive you." More and more Palestinians are calling the escalating clashes civil war. "The gunmen want to destroy the culture of our fathers and grandfathers," said a 16-year-old girl, who gave her name only as Hahla. "We will not allow them to do this. "I'm saying it's enough killing, enough! What are they fighting for? They're fighting over this broken chair, and neither side deserves this broken chair. If neither side can solve their problems, let them go to hell!" The protest was dominated by Fatah supporters. But several clan leaders attended, along with militants from Islamic Jihad and several other smaller factions. The darkness has fallen and invaded all of the Gaza Strip. We tried to protest against the war today, but gunmen shot at us when we tried to cross the street. This was a peaceful demonstration to try to get these gunmen to stop killing our future, to stop killing our hope. The darkness has fallen. There are no other words. Gaza is not a place for human beings anymore. Hamas and Fatah have defeated the Palestinian people. Both factions have triumphed against the hope for the future, for a state of our own. These factions are killing the future for my daughter. She is six years old and has to live through this senseless civil war. Yes, it's a civil war to me — you can call it what you like. This has to stop; these young killers in the street are just boys. They're 17, 19, and 21 years old. They've become killers and they don't realize that they're just being used — by both factions. They're being used by the political leaders who are shouting every day on the satellite TV news shows. These so-called leaders in suits are the real killers, turning our boys into murderers. It will take generations to recover from all this. It will take so long to change this violent culture we've become. If we start today, it will take years. It's become so easy for any young boy to hold a gun and shoot. We now have a generation of damaged youth. There were many brave people today in Gaza during the demonstration. They stood in the middle of the street — in the crossfire with bullets flying everywhere — telling the gunmen to "STOP, STOP, STOP!" Two people were killed. Many people here — including myself — think that the West is doing everything it can to weaken the Palestinian Authority. And Israel is, as well. All of their acts are aimed at Hamas, but they have also weakened Fatah, the more moderate faction here in Gaza. This is hypocrisy by the West and Israel as they steal the hope by tightening this economic embargo against the Palestinian people. Desperate people don't think rationally. Desperate people turn radical. And that is just what is happening in Gaza. Lifelong Gaza resident Hossam al Madhoun works for a Spanish aid agency in the Gaza Strip.